After being introduced, Gutman joked about how the announcement was “the biggest non-secret in politics”. “Now, typically in elections, the voters seem to go for someone who is the opposite of the incumbent and, in this case, Buttigieg is offering himself up as the anti-Trump,” he added. “In his words, he’s a — an intellectual, laidback, gay mayor from the Midwest, who is half the age of the President.” What about all the incumbents that win, Matt? As the video portion of Gutman’s report began, the reporter quipped about how “the unpronounceable name now a household name.” Except, he never offered any polling to prove that. Now, Buttigieg was polling in third place in places like Iowa and New Hampshire, but that was only among a portion of Democrats. It’s a candidacy full of firsts. He’d be the first mayor to win a nomination. The first openly gay man in office. The first president under 40. The 37-year-old with the Boy Scout looks has cultivated quite a resume: Harvard, Rhodes scholar. Oxford, the McKinsey consulting firm, and spending years as a U.S. Navy reserve officer. Earning a joint service commendation medal for his counterterrorism work. He’s been slightly vague on political platform, but in his interview with George Stephanopoulos, described his plan for Medicare. Suggesting the Mayor was a “devout Episcopalian,” Gutman touted Buttigieg’s little feud with Vice President Mike Pence over the freedom of religion. Now, last night I asked for an advance copy for his speech and I was told he’s not writing them out. Now, even his own aides don’t exactly know what he’s going to say. But they tell me he’s been thinking about this obviously for some time. And it will be a big speech in front of his hometown crowd here, right inside that old Studebaker factory. But there will be no teleprompters, no prepared statements. So, in at least that way Dan, it will be a little bit like President Trump. As NewsBusters’ Research Director Rich Noyes previously documented, the media didn’t boast about President Trump’s 2016 announcement. In fact, they treated it like a joke. WHIT JOHNSON: Also in politics this morning, the 2020 race is heating up. In just a few hours, Democrat Pete Buttigieg is expected to officially kick off his presidential campaign. 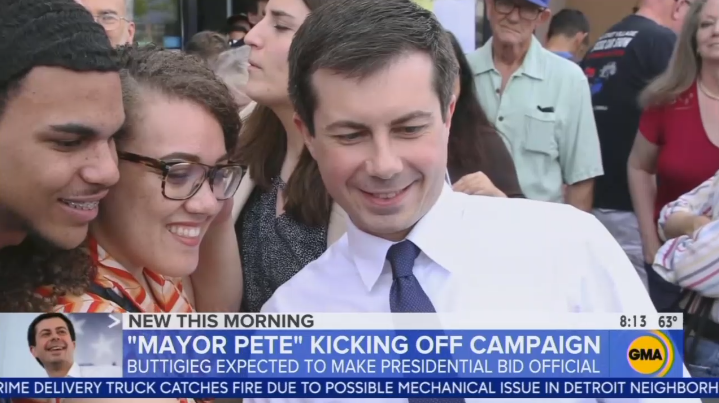 ABC’s chief national correspondent, Matt Gutman is in South Bend, Indiana, with a look at Mayor Pete and the momentum he’s building. Matt, good morning. MATT GUTMAN: Hey, Whit, good morning. That Buttigieg is making that big announcement today is the biggest non-secret in politics. Now, typically in elections, the voters seem to go for someone who is the opposite of the incumbent and, in this case, Buttigieg is offering himself up as the anti-Trump. In his words, he’s a — an intellectual, laidback, gay mayor from the Midwest, who is half the age of the President. GUTMAN: The unpronounceable name now a household name. GUTMAN: It’s a candidacy full of firsts. He’d be the first mayor to win a nomination. The first openly gay man in office. The first president under 40. The 37-year-old with the Boy Scout looks has cultivated quite a resume: Harvard, Rhodes scholar. Oxford, the McKinsey consulting firm, and spending years as a U.S. Navy reserve officer. Earning a joint service commendation medal for his counterterrorism work. He’s been slightly vague on political platform, but in his interview with George Stephanopoulos, described his plan for Medicare. GUTMAN: As a devout Episcopalian, he’s gained most attention for his spat with fellow Hoosier, Vice President Mike Pence. GUTMAN: Now, last night I asked for an advance copy for his speech and I was told he’s not writing them out. Now, even his own aides don’t exactly know what he’s going to say. But they tell me he’s been thinking about this obviously for some time. And it will be a big speech in front of his hometown crowd here, right inside that old Studebaker factory. But there will be no teleprompters, no prepared statements. So, in at least that way Dan, it will be a little bit like President Trump. DAN HARRIS: Fair point. It may end there. Matt, thank you very much. Matt Gutman on the ground in Indiana.